The German elections are the Godot of 2017. There has hardly been a political debate in Europe this year that does not end with some delusional reference to the September 24 poll. Once the elections are over, everything will become so much easier. The truth is that right now is as good as it gets. The two largest parties are in government. They are both pro-European. Together they have 80 per cent of the seats in the Bundestag. They have a majority large enough to change the constitution. No matter which of the polls you believe, their joint share of the vote is about to fall dramatically. One possible outcome is that the present grand coalition of Christian Democrats and Social Democrats will return to power with a reduced majority. Alternatively, chancellor Angela Merkel’s CDU/CSU might form a coalition with the liberal Free Democrats, or with both the FDP and the Greens. The FDP wants to reduce the lending capacity of the European Stability Mechanism, the eurozone rescue umbrella, and phase it out in the long run. And it wants Greece out of the eurozone. What exactly, I wonder, is going to get easier? The truth about the German elections is that nothing much will change. Greece did not get debt relief because the German political system as a whole rejects transfers of any kind. Also German legal interpretation of EU law is that debt relief is illegal. There is not one conceivable election outcome that could soften the current position, but one or two that could harden it. The same goes for reform of the eurozone. When Emmanuel Macron was elected French president in May, he promised to pursue his eurozone agenda — after the German elections. I can see why he wants to focus on domestic policy first, like last week’s labour reforms, but the German vote is, again, entirely irrelevant. The problem has never been Germany’s lack of interest in reform, but the kind of reforms it wants: stricter fiscal targets, stricter implementation, fewer exemptions, penalties for non-compliance, and outside interference in the policies of countries that do not follow the targets. Berlin wants to reinforce the EU’s no-bailout rules through a sovereign debt restructuring mechanism. That would leave the burden of adjustment with the sovereign bondholders, many of which are the domestic banks and insurers of eurozone member states. Ms Merkel has expressed support for a European finance minister. By this she means a full-time chairman of the eurogroup of eurozone finance ministers, rather than the part-time one we have now. Not quite as big a deal as it sounds. President Macron has not yet said what he really wants. His advisers have backtracked on earlier support for a common eurozone debt instrument. This is the crucial issue, not because the eurozone should incur more debt, but because a robust monetary union will, in the long run, require a common safe asset to function. German government bonds are an insufficient Ersatz. They are neither a common instrument, nor sufficiently available. After the bond purchases by the European Central Bank, there are not enough of them left. And their stock will fall further as Germany continues to run persistent fiscal surpluses. If one excludes the common debt instrument from the discussion, you are left with a hyperactive public relations exercise that hides the lack of a genuine economic union. I would not be surprised if France and Germany divert some of their domestic spending into a common investment fund, and label it a eurozone budget. I can hardly wait. The eurogroup and its upgraded chairman will be in charge. The unelected ESM will turn into a monetary fund that will impose conditionality for any financial assistance. It will not answer to the European Parliament because it is an intergovernmental institution outside the scope of the EU treaties. Wolfgang Schäuble even wants the ESM to disburse disaster relief, but beware a German finance minister bearing gifts: the ESM will become the de facto fiscal authority of any country that takes the money. Maybe Mr Macron can soften some of the edges of all this. My reading is that the primary purpose of his eurozone agenda is not to fix a suboptimal monetary union but to strengthen the Franco-German partnership. The fact of the agreement will be more important than the content. I expect he will get his deal — but with Germany’s agenda. WHEN the alarm sounded from loudspeakers in the streets and his mobile telephone around 6am on August 29th, Saburo Ito thought it was a warning about an earthquake. But when he read that a North Korean missile was passing overhead the 72-year-old taxi driver panicked and ran out into the garden. The instruction to “evacuate to a sturdy building or basement” was all but forgotten. “I had no idea what to do or where to go,” he says. Japanese have been oddly sanguine about military threats, even as China has grown more powerful and North Korea has tested ever more capable missiles and atom bombs. Japanese refer to this state of mind as heiwaboke, meaning roughly to take peace and security for granted. 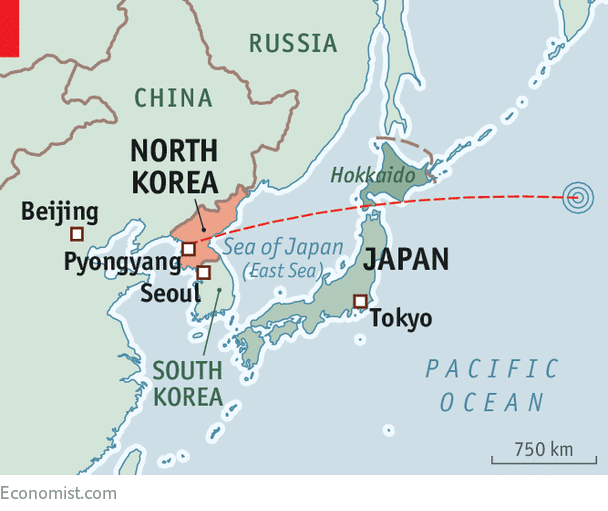 Such complacency may have been shaken by the North Korean missile that passed over Hokkaido before crashing into the sea about 1,200km to the east. “North Korea’s reckless action is an unprecedented, serious and grave threat to our nation,” said the prime minister, Shinzo Abe. It was not the first time that North Korea had fired over Japan; it had conducted similar tests four times previously (under the guise of satellite launches). But the latest shot was a surprise, not least because recent tensions over North Korea’s testing of long-range missiles had appeared to ease of late. America has grown increasingly alarmed that its bases in Guam, or perhaps America’s western seaboard, could soon be threatened by the regime of Kim Jong Un. Japan has long lived under the shadow of his rockets. What is more alarming is the consensus among analysts that his engineers have probably mastered the technology of making a nuclear warhead small enough to fit on a missile. 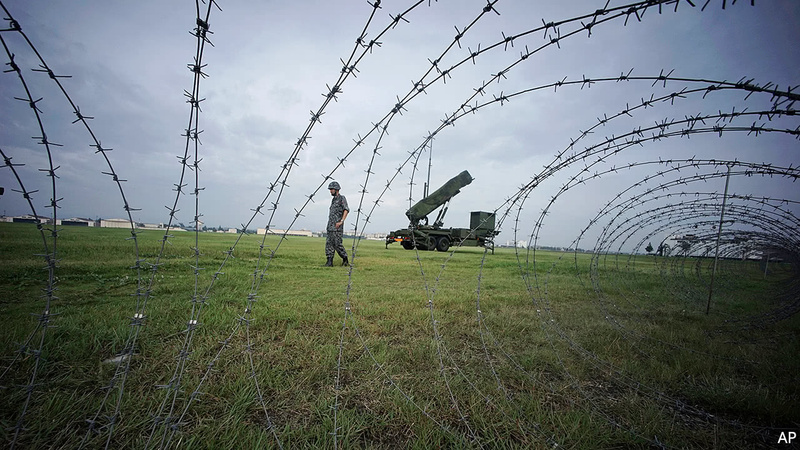 The latest test is raising questions about the preparedness of Japan’s civil defences and the ability of its anti-missile systems to keep the country safe. It is also heightening the debate over whether Japan should amend its pacifist constitution. Over the past year the government has tried to reassure citizens of its ability to protect them. It has published guidelines for how to respond to a missile strike: in short, take cover; and, in the event of a nuclear attack, pull a jacket over your head. Twelve towns have held drills for a North Korean missile attack. They have involved children having to curl up under their desks. For some Japanese such measures are not enough. A very small but increasing number have been building nuclear bunkers and buying air purifiers to protect against radiation in case of nuclear attack. Japan enacted civil-defence legislation only in 2004, almost three decades after South Korea. J-Alert, the emergency public-information system, failed to work in some places. Suguru Arai of the disaster-prevention bureau in the town of Erimo, which was under the missile’s trajectory, points to a flaw in the advice for citizens to take cover: “There are no basements and only a few strong concrete buildings in the town.” Chains of command were inadequate in 2011 when an earthquake and tsunami caused a meltdown at the Fukushima Dai-ichi nuclear power plant. Japan has a double-layer of missile defences: destroyers with Aegis missile-defence systems cover the whole country; land-based Patriot batteries (pictured on exercise, after the latest North Korean missile flew over) provide “point defence” for smaller areas. “But just as the threat grows, our defence capabilities must grow,” says Narushige Michishita, an analyst. Yet there are growing doubts about whether this is enough. The defence ministry wants to upgrade the Aegis systems on the destroyers and to acquire a land-based version, Aegis Ashore. Some members of the ruling Liberal Democratic Party are urging the government to use its budget reserves to speed up the acquisition, rather than wait for an increased defence budget next year. The government is unlikely to add a third layer of missile protection, the Terminal High Altitude Area Defence missile shield that America operates in South Korea, on the grounds that it is too costly. Noboru Yamaguchi, a former lieutenant-general in the Self-Defence Forces (SDF), Japan’s army, says Japan should also raise the number of crews to man Aegis destroyers to relieve overstretched personnel. Japan is trying to improve other capabilities too, for instance by buying F-35 jets. But it lacks the wherewithal to strike at North Korean launch sites if it detects signs of imminent attack—something some officials, including the defence minister, Itsunori Onodera, would like to have. Japan’s military strength will remain limited for as long as it spends less than 1% of GDP on defence (South Korea and America spend 2.6% and 3.3% of GDP respectively). Mr Abe has long thought that Japan should become a normal military power. In 2015 he pushed through legislation reinterpreting the constitution to allow the SDF to play a more forceful role in missions such as peacekeeping. This year he announced plans to rewrite the constitution’s pacifist clause by 2020. That will require approval in both houses of parliament, and a referendum. Mr Abe no doubt hopes the outcry over the latest missile shot will make his task easier. Even so, he would have to overcome great public resistance. And his popularity has been slumping of late amid reported scandals. Psychologist Stephan Grünewald has spent much of his career studying Germans. In a new study, he looked at current political attidudes and discovered raw emotions ahead of the upcoming election. SPIEGEL: Mr. Grünewald, in the lead up to the election, the Rheingold Institute has once again undertaken a detailed analysis of Germany's political state. How did you proceed? Gr ünewald: We put 50 voters on the couch. Twenty-six underwent in-depth psychological interviews, the others took part in three group discussions. Seven psychologists took part in the study, with two of them focusing on eastern Germany. It isn't representative, but you can recognize certain traits. SPIEGEL: What did you find out? Gr ünewald: On a fundamental level, the voters are totally disappointed in this election campaign. They feel like the things that are important to them aren't being discussed and that many things are being glossed over. We wanted to find out why. SPIEGEL: What did you discover? Gr ünewald: In the in-depth interviews, all people wanted to talk about was the refugee crisis, refugee crisis, refugee crisis. Despite being so elegantly left out of the campaign, it is still a sore spot that hasn't been treated by politicians. SPIEGEL: What exactly is the problem? Gr ünewald: The crisis two years ago plunged voters into a dilemma for which they still haven't found a clear response. Do I open the door, or do I close it? On one hand, they want to be part of the welcoming culture, but they are also afraid of being overwhelmed by foreigners and of no longer being able to recognize their own country. As a result, they want policymakers to develop a plan, to establish a compromise position. But they haven't, and now voters feel abandoned. SPIEGEL: What is the consequence of this? Gr ünewald: Voters are disoriented, full of uncertainties. They describe Germany either as an ailing, run-down country or as a secure island of affluence in a sea of risk. It's all very fragile and leads to emotional outbursts. I have never before seen so much anger and hatred among test subjects. SPIEGEL: Do you expect growing political radicalization? Gr ünewald: Not yet, because in reaction to the perceived hardening of the fronts, voters are also taking a step back. They argue that we cannot afford to slip into polarization because we are surrounded by three brutes: Trump, Erdogan and Putin. The anger is being expressed in shadowy digital worlds, but in the analog world, they keep a tighter rein on themselves. SPIEGEL: Is the refugee crisis just a symbol for their discomfort with the difficult state of the world today? Gr ünewald: Yes, because long before the refugee crisis people felt alienated by globalization and were also concerned about global security. SPIEGEL: How is Trump being perceived? Gr ünewald: He works to Merkel's advantage. Because of him, Putin and Erdogan, she is seen as the person who can tame the brutes. The chancellor is seen as the only one we can depend on, so we have to have a good relationship to her. Gr ünewald: Amid the skepticism around Merkel, Martin Schulz (of the center-left Social Democrats -- SPD) arrived early this year as a figure seen as down-to-earth with a take-charge attitude. He was seen as a returning father, someone to finally fill the paternal vacancy in German politics -- and it was blown up to almost messianic proportions. Schulz, the person, couldn't fulfill these expectations. He is seen more as a friendly uncle. The SPD faces a potential disaster in this election. SPIEGEL: Could the right-wing populist Alternative for Germany (AfD) party do better than polls are currently leading us to expect? Gr ünewald: The AfD channels a lot of this anger but it doesn't have a leadership figure. As such, it was a mistake to remove Frauke Petry from the spotlight. The tendency of voters to keep themselves in check, as I described earlier, won't help the AfD. SPIEGEL: And the Green Party. Will they do well because climate change is such a critical issue? Gr ünewald: No, it'll be tight for them. People think their problems lie elsewhere. And the Greens are also seen as arrogant because their fight for nature is often directed against human nature. SPIEGEL: How do your test subjects see their personal situations? Gr ünewald: Good but they are also struggling to find their place. Workplaces, daycare spaces, parking spots. Housing is also a big issue. All are symbols for the strong need for structure and orientation. SPIEGEL: Does the chancellor provide this order? Gr ünewald: In part. She will win by a wide margin, but it is still little more than a half-hearted expression of loyalty. The tried-and-true will once again be put on probation. SPIEGEL: If the far-left Left Party, the SPD and the Greens had fielded a different joint candidate and promised a completely different plan of action, would that have been well received? Gr ünewald: We discussed a variety of possible coalitions with the test subjects. But that one was never mentioned. SPIEGEL: What came up instead? Gr ünewald: Merkel with (Christian) Lindner (of the pro-business Free Democratic Party -- FDP). There was a real love for Lindner in the interviews. The FDP's candidate is seen as a modern TV star, even like a kind of 007, who can engender change. A kind of dream team is the result: the proven Merkel and a mini German Macron that gives her a helping hand. As such, I'm predicting a coalition of Merkel's conservatives with the FDP. DENVER – Earlier this month, North Korea went a couple of weeks without launching any missiles or testing nuclear weapons. That short interval, which has since ended, was enough to inspire US Secretary of State Rex Tillerson to declare that North Korean leader Kim Jong-un was showing “restraint.” Perhaps, Tillerson concluded, Kim is ready to engage in dialogue. To some extent, he may be right. To be sure, claims that the North was showing restraint were clearly premature: North Korea has since fired three short-range ballistic missiles from its east coast into the sea, and, more ominously, launched a ballistic missile over northern Japan. Tillerson’s optimism about such a short pause reflects the pressure diplomats face in reassuring allies – and, in Tillerson’s case, his boss, President Donald Trump – and easing tensions with enemies. Nonetheless, Tillerson is probably right that North Korea is ready to talk to the United States – but only as one nuclear-weapons state to another. What the country’s leaders are patently not ready for is to meet America’s own requirement: that negotiations are based on the international commitments made in 2005, at the end of the fourth round of the so-called six-party talks. Chief among those commitments, enshrined in a joint statement released at the end of the talks, is North Korea’s abandonment of “all nuclear weapons and existing nuclear programs.” In exchange, the other five participants in the talks (China, Japan, Russia, South Korea, and the US) were supposed to provide North Korea with energy and economic assistance, respect its sovereignty, and pursue the normalization of diplomatic relations. The five participants stood by their commitments, but North Korea repudiated its own in 2009. Tillerson rightly refers to a two-track policy toward North Korea. One track is dialogue; the other is pressure, applied through sanctions and other measures aimed at isolating North Korea and convincing its leadership that it has no future with nuclear weapons. After North Korea’s tests of its new intercontinental ballistic missile (ICBM) last month, Tillerson and the US ambassador to the United Nations, Nikki Haley, focused on the second track, working with other Security Council members to impose the toughest sanctions ever against the North. Those sanctions could erode much of North Korea’s trade with China, the Kim regime’s economic lifeline. But the US cannot rely excessively on other countries to constrain the North Korean regime, whose pursuit of nuclear weapons is not a symbolic quest. As its ICBM tests show, the goal is to threaten the US explicitly, in order to compel it to reduce its presence in Northeast Asia – and perhaps even reconsider its alliances with Japan and South Korea. This ambitious goal is not without tacit support in the world: Russia and China have proposed that the US suspend its annual military exercises with the South, in exchange for a freeze of North Korea’s nuclear program. This supposedly fair-minded “freeze-for-freeze” proposal would do more to weaken the US-South Korea alliance than it would to impede North Korea’s development of a deliverable nuclear weapon. The proposal highlights how difficult it is to mount an international response to the North Korea nuclear issue. Though China agreed to the recent sanctions in the Security Council, there is widespread skepticism about whether there is an internal consensus about the future it wants for the Korean Peninsula. Russia, for its part, seems to be pursuing a foreign policy guided more by spite than national interest. America’s allies in the region, meanwhile, are under serious pressure. South Korea’s new government is stuck between the need to manage its relations with the US and the desire to open a dialogue with the North. And, as the North’s latest missile launch shows, Japan’s hosting of US military assets puts it on the front lines of the crisis. Trump’s statements about China’s role in addressing the problem don’t help, as they imply an interest in effectively outsourcing the job of reining in the Kim regime, in exchange for vague economic and trade assurances. The result is a perception of American unseriousness about this most serious of challenges. The Trump administration has assembled before it all the components of an effective North Korea strategy: cooperation with China; pressure on North Korea through sanctions and isolation; reassurance of allies, including by providing the most up-to-date anti-ballistic missile defenses; and a willingness to talk. But for any of these instruments to have an impact, they must be used in concert and with precision in tone and substance – a quality of statecraft that the Trump administration has been slow to master. In this sense, the challenge in North Korea is not just a nuclear crisis. It is a crisis of the quality of US leadership. Many see the problem, but no one knows yet how to overcome it.